Adam Shingler was born in Tucson and graduated from Sahuaro High School in 2012. He was the starting libber for the varsity team at Sahuaro for three seasons. In 2011 and 2012, Adam was selected to the All State Second Team. In 2012, he was also selected to the All Section First Team. Adam played with APV, a local boy's club program, from 2008-2012. Adam began coaching at Sahuaro High School in 2015 as the varsity assistant. In 2016, the team advanced to the state semi-finals. At the beginning of the 2017 season, Adam was hired as the varsity coach for Sahuaro. 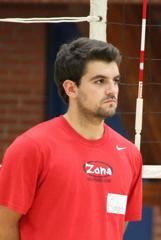 Adam has been coaching with Zona since the 2013 club season. During the 2015 season, he was an assistant coach with the 15-1 team that finished 2nd at the Volleyball Festival. In 2016, Adam was an assistant coach with the 17-1 team earned a bit for USAV Nationals. Adam has a Bachelor's Degree in History and Master's Degree in Education. He currently teaches history at Sahuaro High School.